Durable, precision quality and 100% practical. 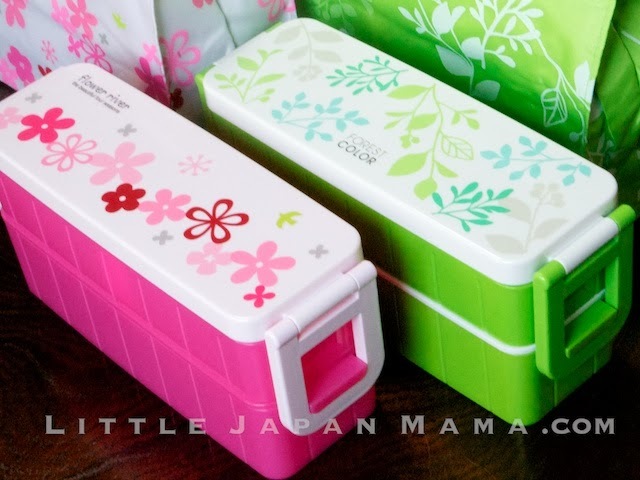 That's what makes these 630ml+ ladies bento box sets my favourite. ... Did I mention feminine and cute?? 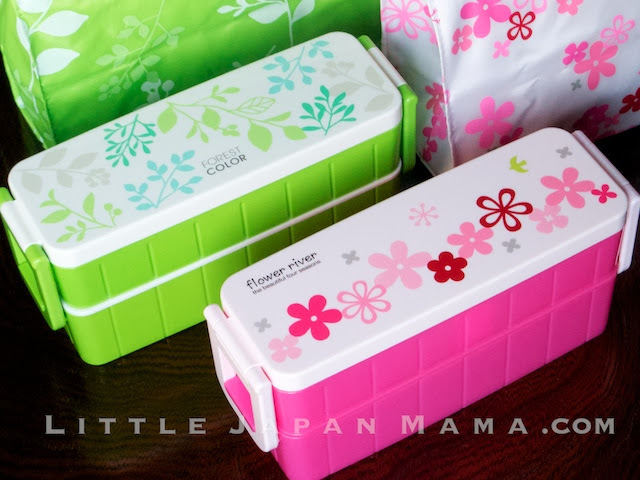 "Flower River" features a very slightly translucent jelly-pink upper and lower box and divider, and a cherry blossom coloured (very pale pink) external (upper) lid with a playful flower design. 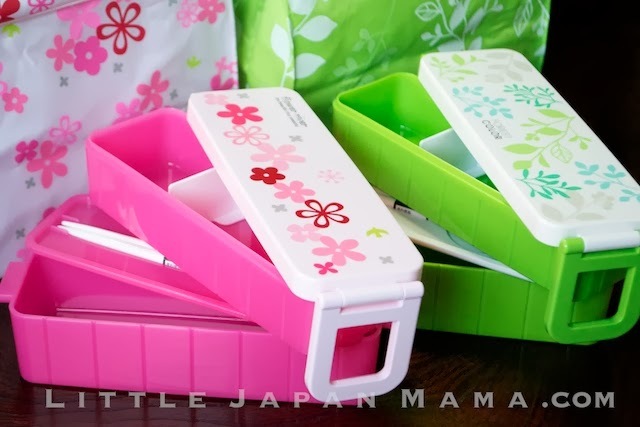 Your bento was never so exciting as when it came in a colour which seemed to call "eat me!" "Forest Color", with its nature-loving leafy design, has light yellow-green upper and lower boxes and end clips, with both external (upper) lid and internal lid in pure white. Lunch is a time to relax, and if you can't be physically surrounded by nature, you may as well have a bento box which lets you imagine it. The silicone seal in the external (upper) lid is excellent quality (passed my water leak test - details below) and easily removable for washing. Microwave safe for re-heating, only with both lids removed. I tested the upper lid seal by half-filling the upper box with water and shaking it upside-down. Completely dry. 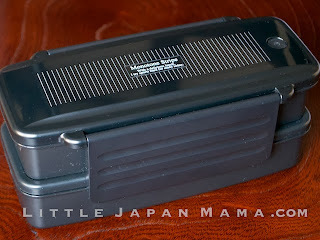 It didn't leak even a drop, which is more than I can say for a similar non-made-in-Japan bento box I tested. While I can't guarantee that the seal of your box won't leak under any circumstances - and I don't physically test every box I send out - so far for me, the upper compartment of this bento box has been 100% leak-free! 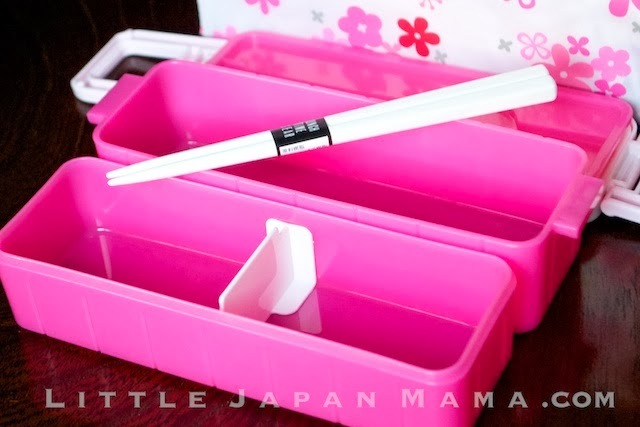 Since living in Japan I just love the way everyday items are designed to be so easy to use. 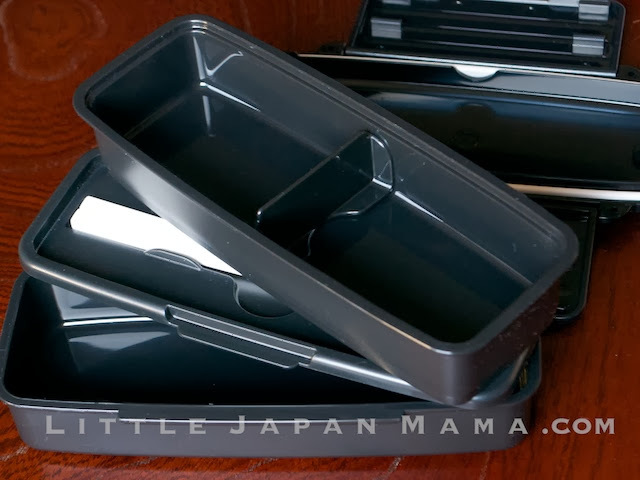 This 840ml+ Black Two-tier Bento Box Set is not just a stylish modern design, it's also seriously practical. 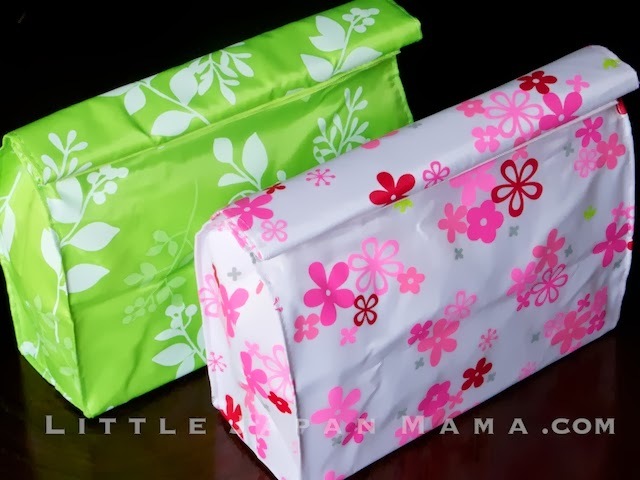 It includes a lower box with internal lid and an upper box with an airtight external lid with clips which snap shut on the sides of the lower box, holding it all tightly together. 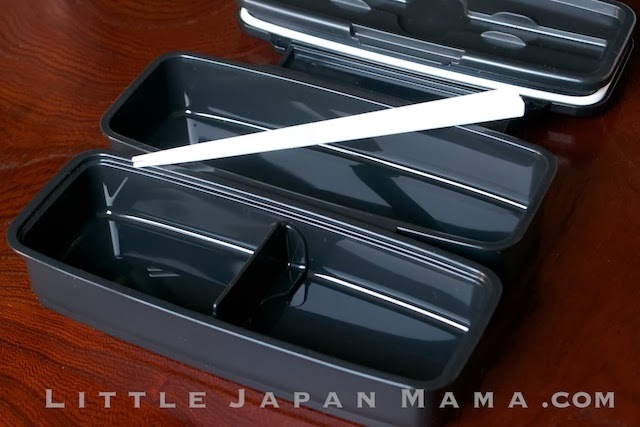 It comes with an internal divider and an 18cm pair of chopsticks. The upper box has a silicone seal in the lid to help prevent leakage and and an inner divider to separate your okazu. The silicone seal is excellent quality and easily removable for washing. 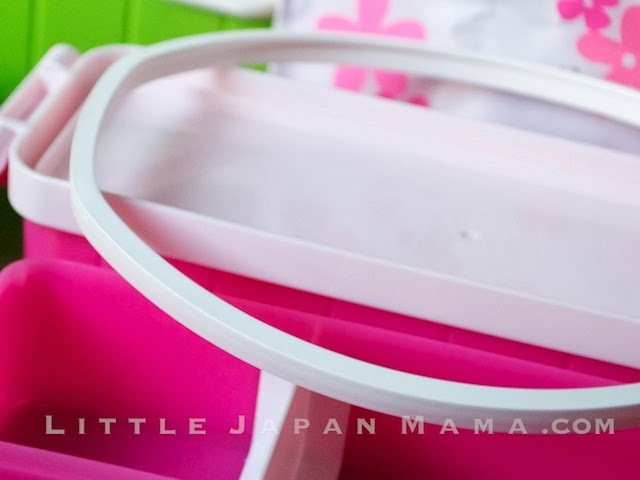 The divider fits snugly so it stays in place, and can be moved to your desired position, or removed if you prefer. The lower box is perfect for holding your rice. 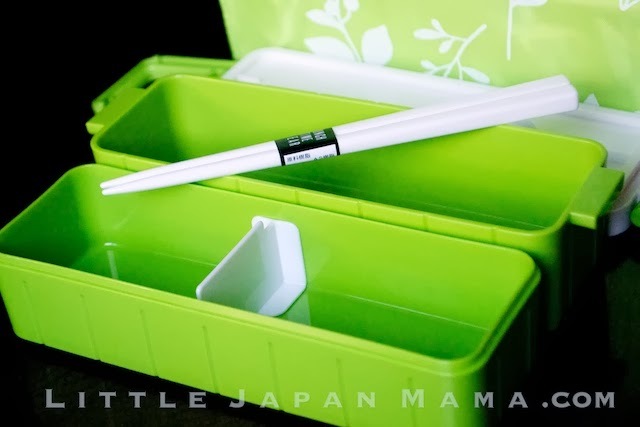 The internal lid doubles as the chopstick compartment. Compact Storage: The upper box nests inside the lower box and the upper lid clips it shut to perfectly hold it all together in a more compact form for carrying home and storage. 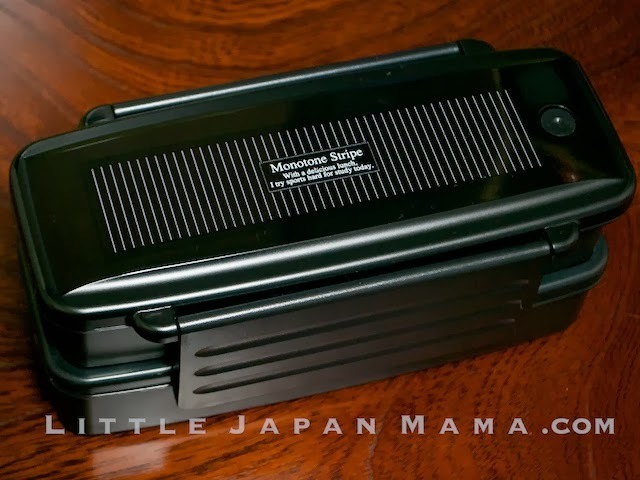 Size: L This bento box is the perfect size for a man's full bento lunch. I tested the upper lid seal by half-filling the upper box with water and shaking it upside-down. Completely dry. 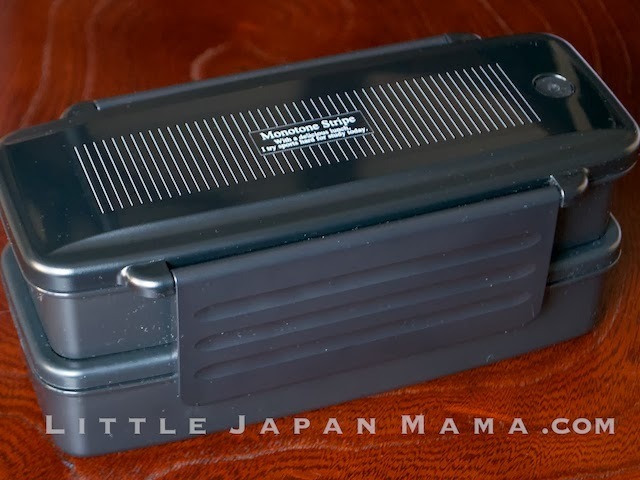 It didn't leak even a drop, which is more than I can say for a similar non-made-in-Japan bento box I tested. 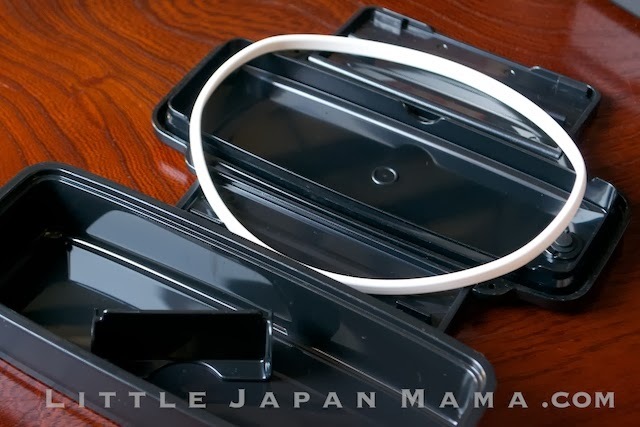 While I can't guarantee that the seal of your box won't leak under any circumstances - and I don't physically test every box I send out - so far for me, the upper compartment of this bento box has been 100% leak proof! 3. 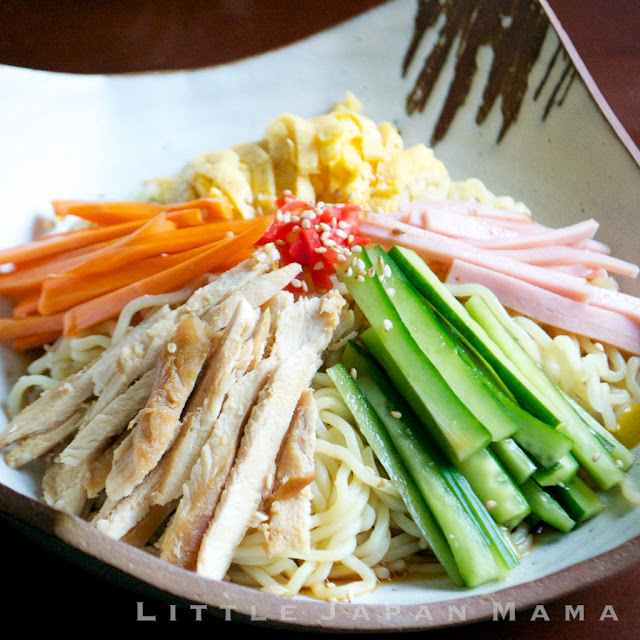 Pour Hiyashi Chuka Sauce over it all. 1. Place all sauce ingredients into a small jar and shake to combine and dissolve sugar. To prepare egg: Crack one egg into a bowl, add a small pinch of salt and sugar and beat lightly. Pour into a pre-heated, oiled frypan. After it looks firm enough, carefully flip and turn off heat, allow to cook a few seconds, then tip onto a plate. Wait till cool before slicing. Cook one egg for each person. 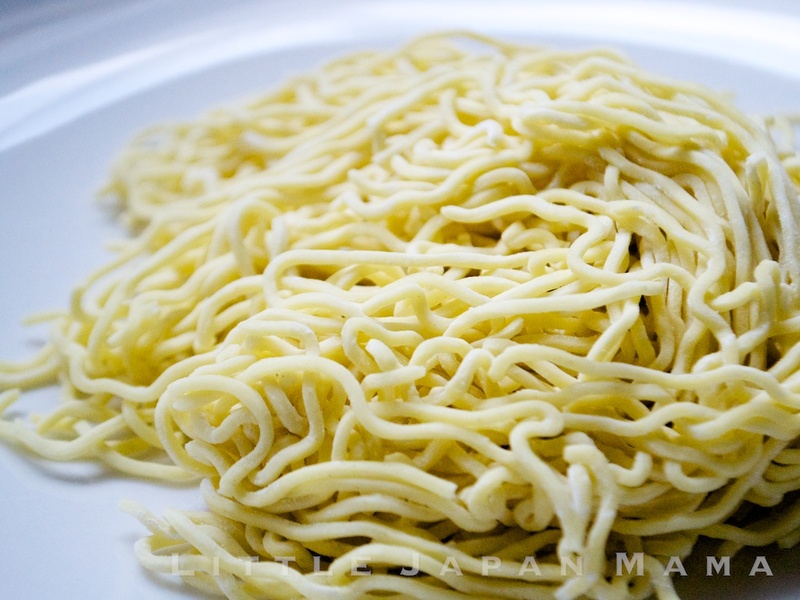 Fresh Ramen Noodles are thin wheat noodles which have a light dusting of flour. To prepare fresh ramen noodles for Hiyashi Chuka: Place noodles in rapidly boiling water and boil noodles until done. Tip into a colander, fill the saucepan with cold water, return noodles to saucepan, tip out into colander again, fill saucepan with cold water again... do this 3 times to rinse and chill the noodles. 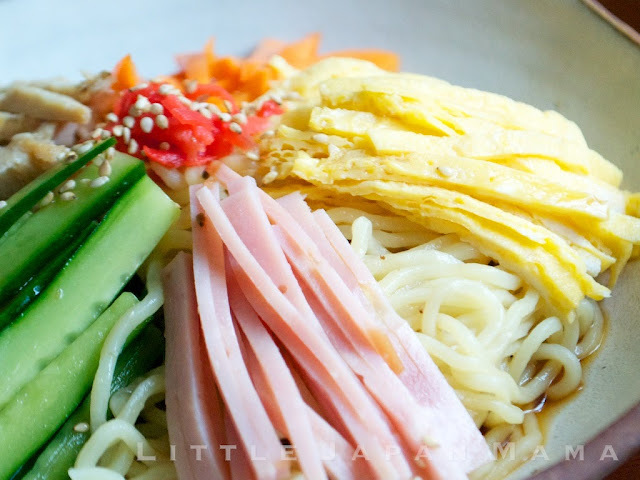 Delightfully refreshing hiyashi chuka noodles are our favorite this summer. 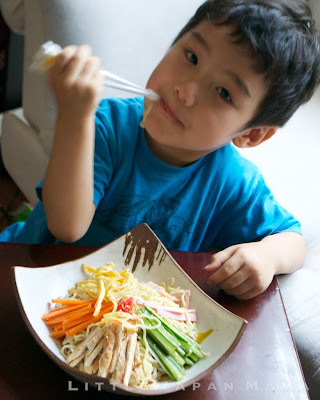 There are a few other kinds of cold noodle dishes in Japan. 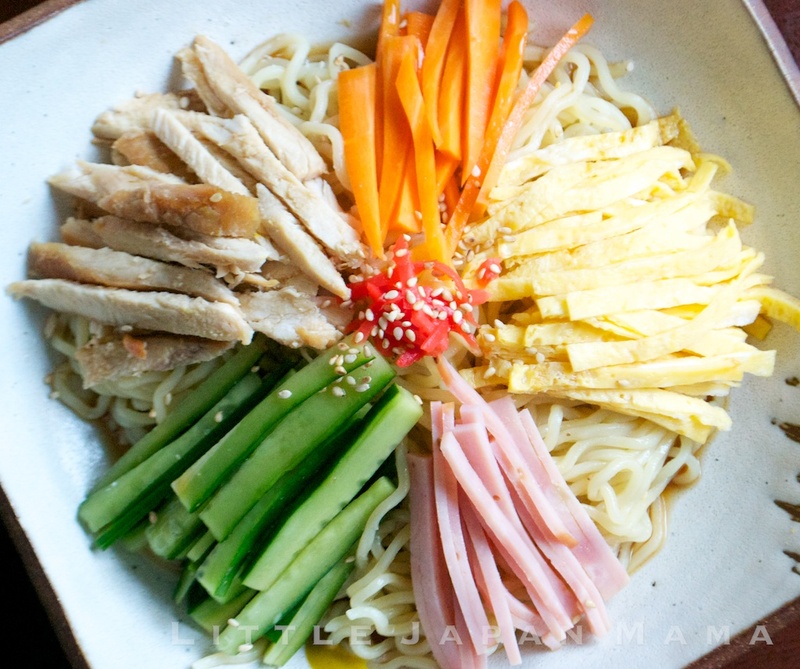 While somen and soba are purely Japanese dishes, Hiyashi Chuka is actually a Japanese adaptation of a chinese-style dish. 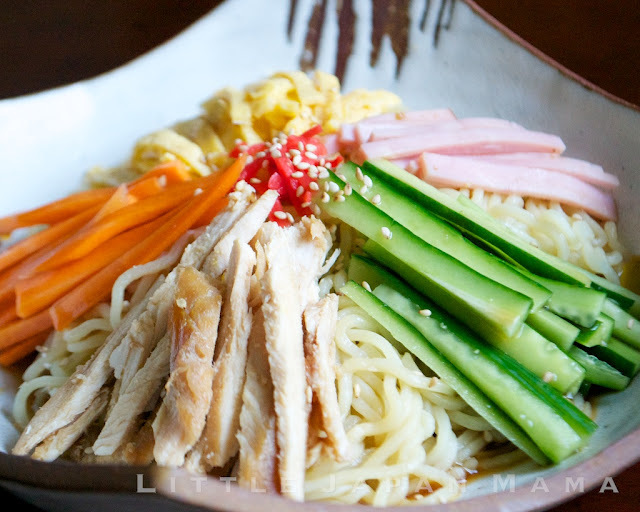 "Hiyashi" means "Chilled" and "Chu-ka" means "Chinese"
If you can't get fresh ramen noodles, try another kind of fresh chinese noodles with an elastic texture which are made for soup. 1 Tbsp cornstarch or katakuriko, dissolved in about 100ml water. 1. Heat about 2 Tbsp oil in a wok or frypan. Grill the sliced onion, eggplant and bell pepper until the onion is fragrant and the eggplant and bell pepper have a slight grilled look. Remove and set aside. Rinse the wok with a little water. 2. Heat another 2 Tbsp oil in the wok. Add the pork and turn it just enough to allow the pork to have golden-brown marks. Add the ginger and carrots, sake, soy sauce and sugar, and cover with a lid until carrots have softened. 3. Add the grilled vegetables, sesame oil and cornstarch mixture. Heat, stirring, until the sauce thickens. 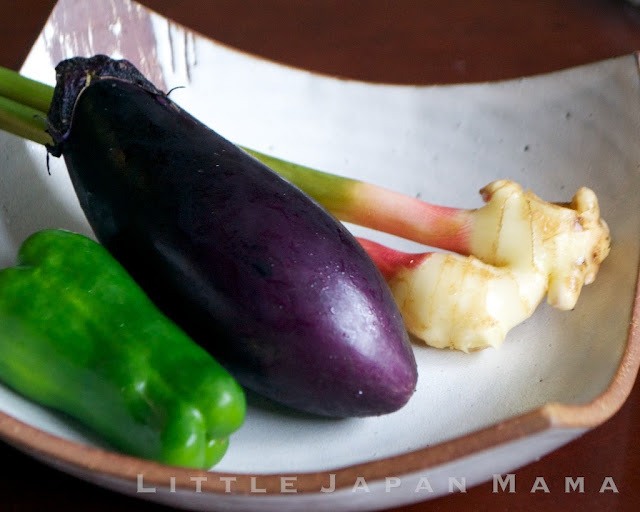 I love buying my fruit and vegetables at the local old style produce markets in Japan. Aside from the better prices, the selection and quality is excellent. I was captivated by the aroma and colour of this fresh ginger and determined that it would become the special ingredient in my next dish. so decided to put all these flavours together. And came up with this Pork Ginger Stir-Fry. Thanks for your patience ^_^ Im back home now so will try to find time for posting more cooking! 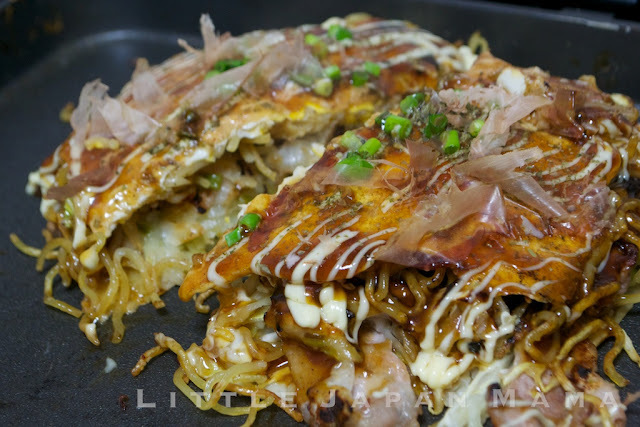 After posting my first Osaka Style Okonomiyaki Recipe, one of my friends asked me, "How about the okonomiyaki with noodles in it?" 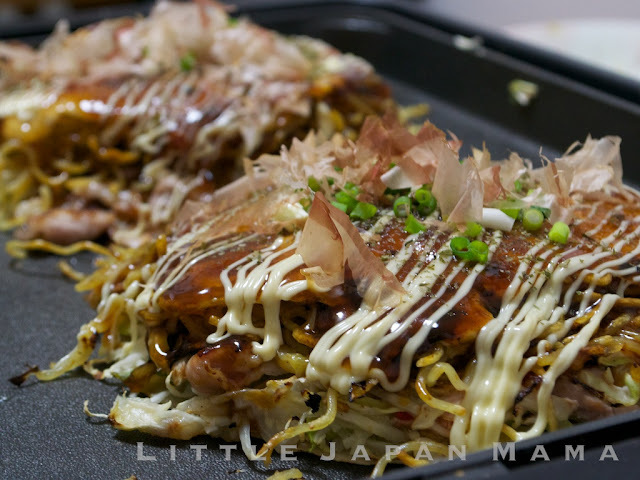 She may have been referring to this, Hiroshima style Okonomiyaki, (also known as Hiroshima-yaki ) which has a layer of yakisoba noodles. 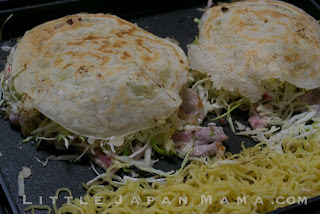 The other main difference between Osaka Style Okonomiyaki and Hiroshima Style Okonomiyaki is, while in Osaka style Okonomiyaki the ingredients (or at least, the cabbage) are mixed together into the batter, in Hiroshimayaki, each ingredient is added separately in layers. 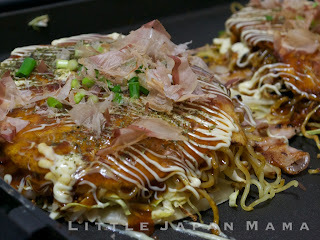 Coming from a Kansai background, I had grown up on Osaka style Okonomiyaki. So, to add Hiroshimayaki to my blog, I first had to master it. That journey has been quite delicious. 1. Mix together flour, water and dashi powder to make the batter. It should be quite runny, but not watery. Adjust if necessary (I can't be bothered measuring on scales, so cup measurements are always approximate). 2. 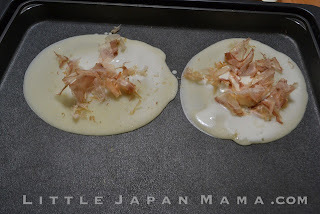 Using a ladle, pour a little batter onto a preheated hotplate/teppanyaki plate/frypan, and swirl the bottom of the ladle around on it to spread the batter thinly. Sprinkle with Katsuobushi. 3. 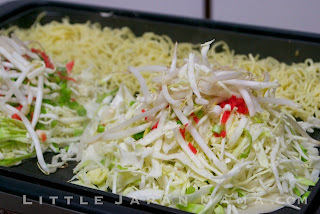 Place a very large handful of shredded cabbage on the base, followed by ginger, shallots and bean sprouts. 6. Pour a little batter over the meat and vegetables, then using two spatulas, flip the whole thing over. The base crepe now becomes a "lid" under which the vegetables can cook. Don't worry if a little cabbage falls out the sides when you flip it, just sweep it all under the "lid". 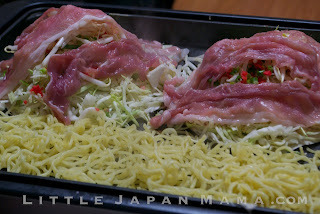 Turn the yakisoba, which should now be getting crispy. 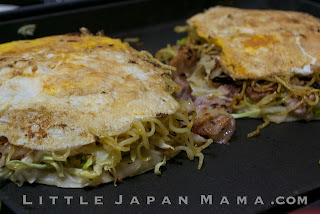 Spread the yakisoba noodles out into a circle the size of the okonomiyaki, then lift the okonomiyaki (using two spatulas) and place it on top of the noodles. 8. Crack an egg onto the hotplate in the spot where the yakisoba was. Break the yolk and spread the egg out a bit. 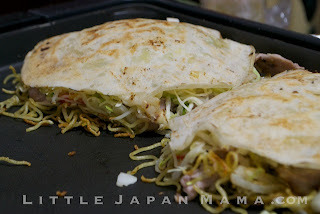 Lift the okonomiyaki and place it on top of the egg. 9. When the egg is cooked, flip the whole thing, egg side up. 10. Generously spread Okonomi Sauce on top, followed by mayonaise, ao-nori, shallots and katsuobushi. *The pork is not paper-thin sliced pork as we would use in a nabe (hot pot), rather it is ideally medium-thin sliced pork belly (with a bit of fat on it) but a little thinner than Korean Samgeopsal pork. Step 1: Batter "quite runny but not watery"?? 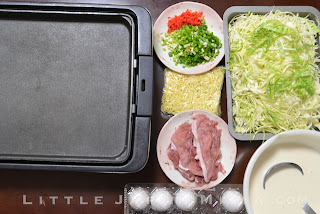 The perfect batter consistency is similar to that of Osaka Okonomiyaki, it just takes a little practice, and you'll know what I mean...sorry. Step 3: The vegetables will look like the hugest pile ever when you put them on raw, but when they cook at step 6 they flatten out. Step 6: Don't overcook the cabbage at step 6, or you end up with the taste of... overcooked cabbage. Okonomi Sauce: I've been asked about substitutes before, but for Hiroshimayaki, Okonomi Sauce doesn't really have any good substitute. Even Tonkatsu Sauce (which my mother often uses for Osaka style Okonomiyaki) is just a little second-rate here, sorry. Su-Buta (lit. 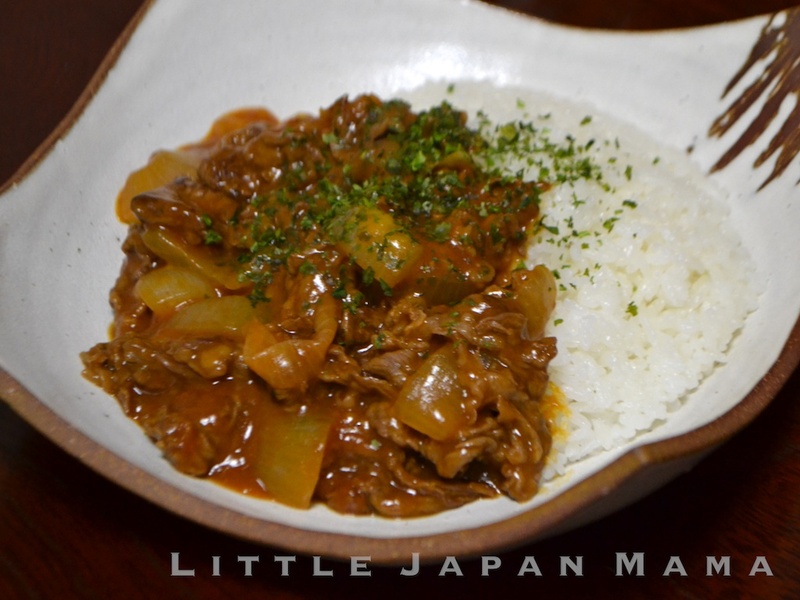 Vinegar Pork) is a classic Japanese Chu-ka (Chinese style) dish, and many Japanese make it using a packet-mix for the sauce. However there is really no need for a packet mix, as the ingredients for the sauce are probably already in your kitchen! The meat is just coated with cornstarch and shallow-fried, so it's very easy. 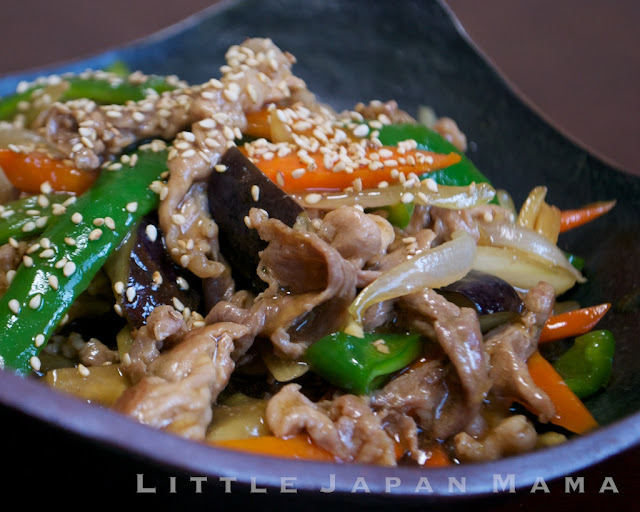 Or if you're really lazy like me, sometimes you might make it by just stir-frying the meat along with the vegetables. 1. Place all sauce ingredients in a cup and stir. Set aside until the end. 2. Place a few tablespoons of cornstarch with a little salt and pepper in a plastic freezer bag. Add sliced pork or chicken and shake to coat well. Shallow-fry with oil until browned and crisp. Remove from oil and let drain. 3. 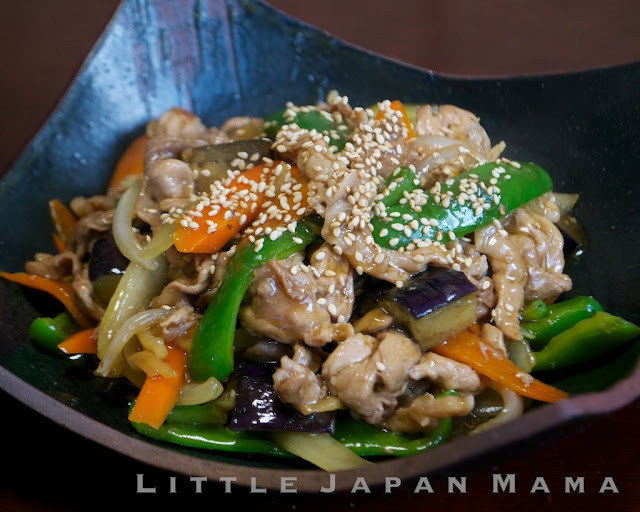 In a wok or large frypan, heat a little oil and stir-fry the vegetables, adding capsicum/piiman last so as not to overcook. 4. Give the cup of sauce ingredients another stir, then add it to the vegetables, continue stirring over medium heat until the sauce thickens. 5. Add the cooked pork/chicken and stir to combine. 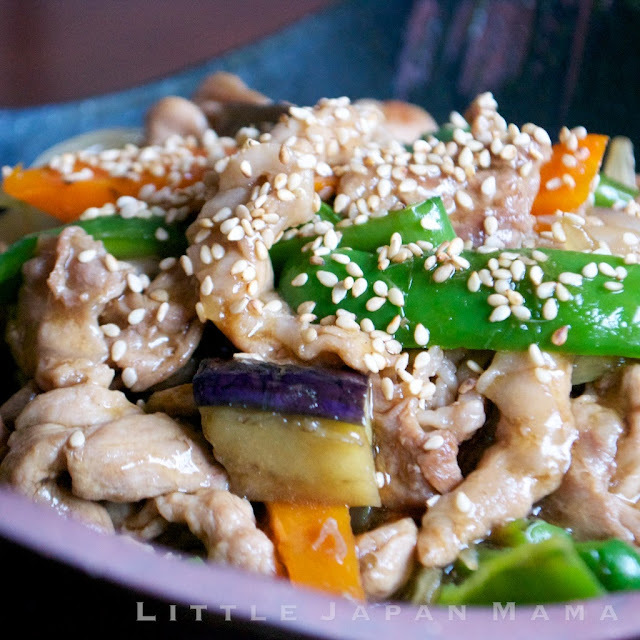 I often make this dish with chicken just because chicken is much cheaper in Japan, however if you make it with pork, you'll know why the dish is called "Sweet and Sour Pork", as the unique taste of pork goes amazingly well with the Sweet and Sour. 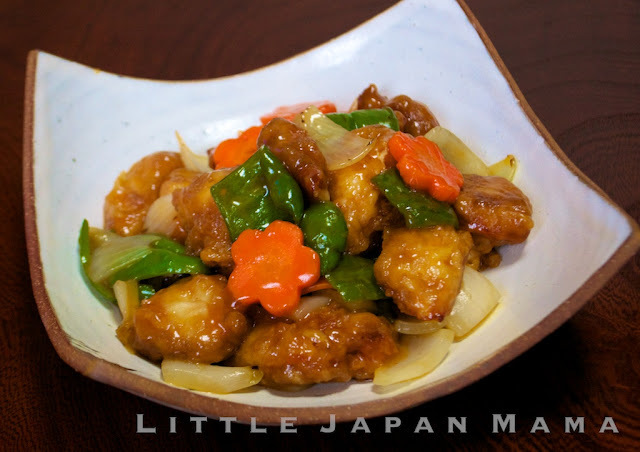 Although it is best fresh and hot, left over Sweet and Sour can even find a place in your bento lunch the next day! Like Cream Stew and Corn Potage, Hayashi Rice is a Yoshoku dish, which means it is the Japanese adaptation of a Western-style dish. 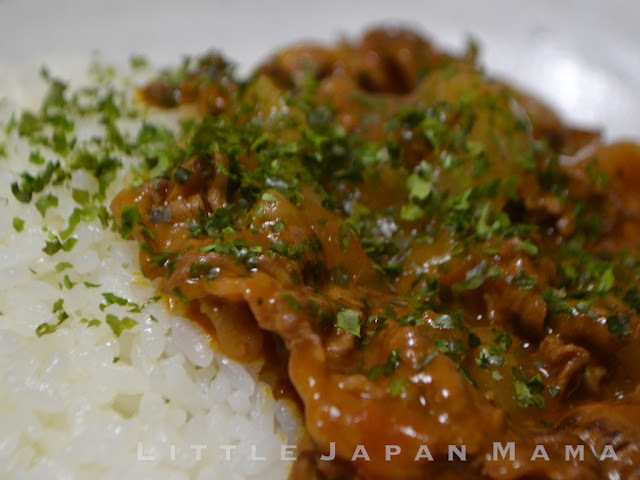 You can buy blocks of Hayashi Rice Ru (ハヤシライス) for the sauce base, however, I prefer to make things from scratch - and if you're not living in Japan, it's certainly the more accessible and affordable option. I like to find easy ways to do things, so like most of what I do, this recipe is super-easy, avoiding the annoying procedure of making the demi-gras (that's a french word) separately, but producing pretty much the same result. 1. Melt 1 Tbsp butter in a frypan, and stir-fry beef and onions until beef is browned and onions are tender, adding the other Tbsp butter half-way through. 2. Sprinkle flour over, quickly stir to coat the beef and stir-fry for a minute longer. 3. Pour wine(or sake) onto the beef, let the alcohol evaporate a little, then add all remaining ingredients, stir and simmer 20 min. Serve with rice on a pasta bowl or plate and sprinkle with Ao-nori, if desired. Eat with a fork and spoon (not chopsticks). 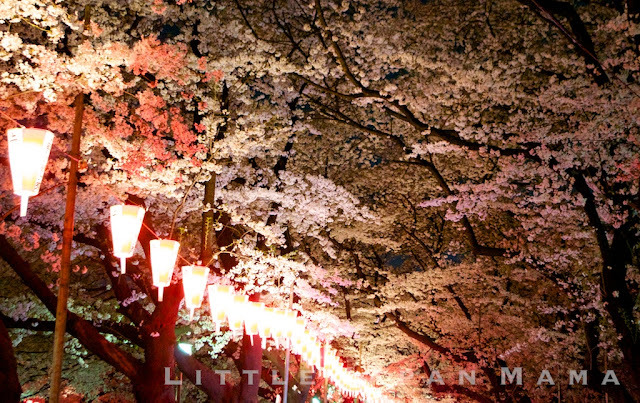 If there's one thing more spectacular than the Sakura (Cherry Blossoms) in full bloom, it is seeing them lit up at night - "Yozakura" in Japanese. 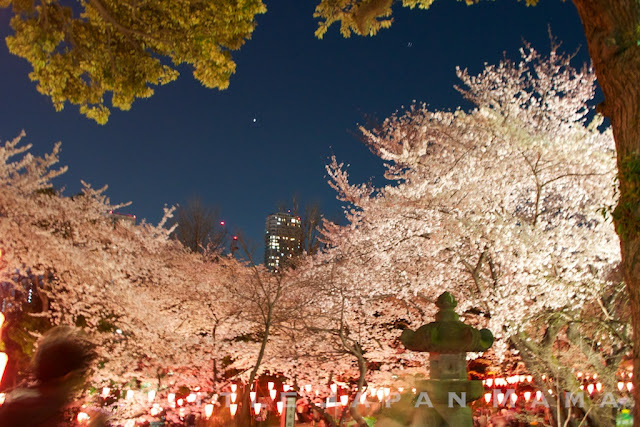 Ueno Park is one of the most popular spots in Tokyo for Hanami (Cherry Blossom Viewing or Picnic-ing), and is buzzing each night of the season with thousands of Hanami picnic partiers. Illumination is generally from the end of March to around the first two weeks of April, to co-incide with the height of the short-lived Sakura blossoming. 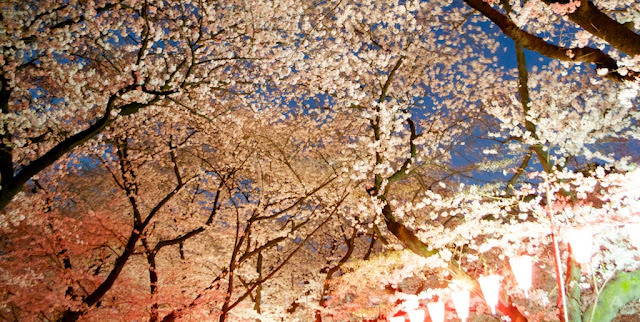 Dates vary from year to year. These are a few of the pictures I took April 12th last year at Ueno Park. 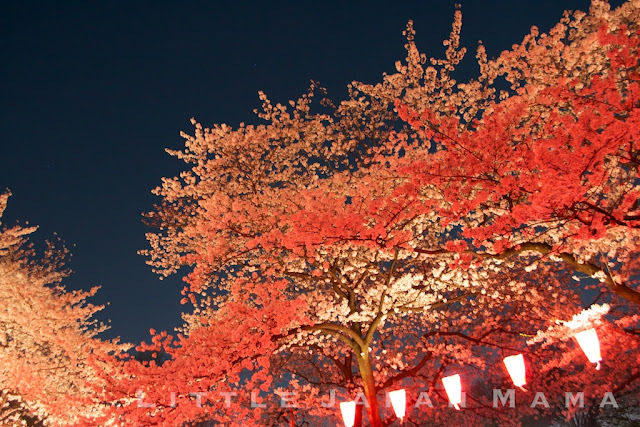 Illumination is from 5:30 until 10pm. 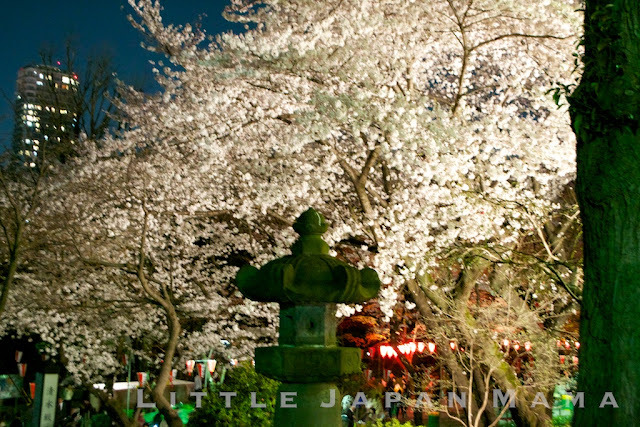 I thoroughly enjoyed the beautiful Yozakura as I walked through Ueno Park, but unlike places such as Shinjuku Gyoen, (see link for last year's photos) Ueno Park is not the most family-friendly Hanami picnic spot as it is quite crowded, and the large majority of picnic-ers are consuming (substantial amounts of) beer. They are otherwise well-behaved, however, and I did see one or two other young families like ourselves enjoying the evening. 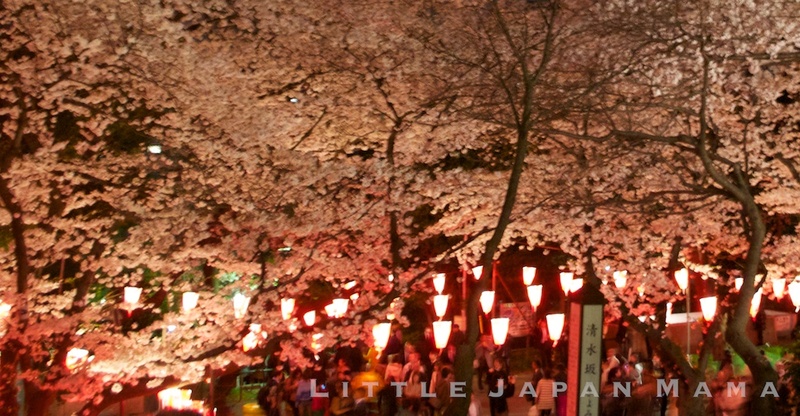 The end of March to the first half of April is definitely a good time to visit Japan.